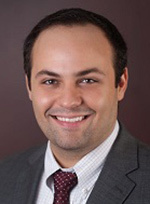 Paul Shkreli has joined Secrest Wardle’s Troy office as an associate attorney and member of the firm’s motor vehicle litigation and premises liability practice groups. Prirviously, Shkreli was an associate attorney at Vandeveer Garzia PC handling defense litigation in the areas of first-party automobile claims, third-party automobile negligence, personal injury, premises liability, and general negligence. He also worked for Bagley & Langan PLLC. He earned hsi Bachelor of Arts in psychology at Michigan State University and his juris doctor at Michigan State University College of Law.